My mother called it “God’s will.” At those moments in my life when things did not go as I had hoped or planned, and there were many, she would say, “It’s God’s will, Samuel.” This was hardly comforting to a six-year-old boy, even one “blessed” with a healthier dose of perspective than most children at that age. Now, as an adult with that healthy dose of perspective we call experience, I realize my mother was right, as she was so often when it came to my life. We think we have control over our lives, especially when we’re young and seemingly invulnerable. We’re told we can do anything we set our minds to, that the world is our oyster, that all we have to do is shuck the hard shell and pluck the rich, nourishing meat inside. I realize now, however, that the shell is a lot harder than I appreciated, and that I never could have controlled or even predicted the things that would happen in my life. We believe we choose the paths we take when we come to those forks in our lives—the friends we make, the careers we undertake, the spouses we marry. Life is either a collision of random events, like billiard balls during a break careening off and into one another, or if you are so inclined to believe, our predetermined fate—what my mother took such great comfort in calling God’s will. I desperately wanted to believe my mother was right. I wanted to believe God had a plan for me when David Bateman hit me in the face with a rubber ball on the schoolyard playground and placed us on a cataclysmic course ultimately leading to his death. I wanted to believe God sent Ernie Cantwell from Detroit, Michigan, the only African American child in my class, to be the friend I so desperately needed. I wanted to believe it had been God’s design that Mickie Kennedy would storm into my life in the sixth grade like a Midwest tornado, uprooting every precept I’d been taught about the roles of boys and girls and toppling the Catholic ideology my mother and the nuns at Our Lady of Mercy spoon-fed us as a remedy for every personal and societal ailment. Mostly, I wanted to believe that I was fated to live the extraordinary life my mother so ardently believed I was destined for, the life she dutifully prayed for each night as she sat on our floral couch in our wood-paneled family room, kneading the beads of her rosary. Was it God’s will that I should buy this house just two blocks from the shingled home in which I was raised and live in a town I had once sought desperately to escape? I thought I purchased my home because it was a sound investment, a plot of land in an up-and-coming real estate market. My parents had not been so practical. My mother’s only real estate criteria had been that our home be within walking distance of a Catholic church and school. The end result, however, has been the same. Except for a decade when I fled, I have lived my entire life close enough to hear the bells ringing in the steeple of Our Lady of Mercy Catholic Church. And yet, despite my proximity, I can only recall hearing those bells on a handful of occasions. Today was one of those times, and for some unknown reason—fate, destiny, or perhaps “God’s will”—the toll of those bells has compelled me to sit at this keyboard and write of my mother and father, and of David Bateman, of Daniela and Trina Crouch, and, of course, of Ernie and Mickie. The sound of those bells has even provided me with a logical place to start this story, my story—a memory of another day when I heard those same bells—or thought I did. 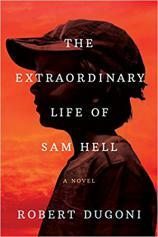 Excerpted from THE EXTRAORDINARY LIFE OF SAM HELL with permission of Lake Union Publishing. Copyright © 2018 by LaMesa Fiction LLC. All rights reserved.